Before you proceed, I would like to recommend you the easiest way to Monetize Your Site using Text Link Ads. Sign up now via the link or banner then start making money almost instantly! Enable all plugins included in the package before using this theme. You can use the Theme Switcher on the sidebar to switch between the wide version (1000px wide) and normal version (770px wide) in order to see the difference. Check out the widgetized version v2.0 too! Please do not use my themes for sites with pornographic, sexist and/or racist content of any kind. What can Ads Minded actually offer ? Ads Minded uses a high CTR AdSense layout created by me which I named it QuickSenseTM (sounds similar to quicksand). Ads Minded was built with search engine in mind. I place the content column on the left side and the 2 sidebars on the right so that search engines read the blog content first before crawling the not-so-important items on the sidebar. The sequence you place the advertisements is important because the first advertisement code usually carries highest paying advertisement. Hence, due to the high CTR of QuickSenseTM, I place it on top of all codes in order to get high paying advertisements. Advertisements can be shifted around in the blog for better targeting just by shifting the advertisement codes. Each column can at least contain one type of advertisement format. They are designed to nicely fit different type of advertisements. Here is the clearer screen shot. 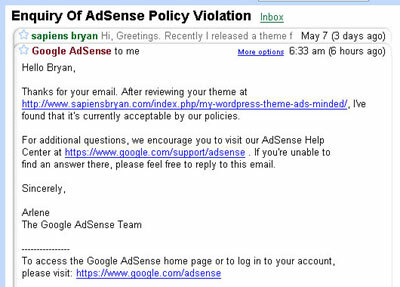 So, it’s now confirmed that Ads Minded is 100% Compliant with AdSense TOS. 3. Login to WP admin control panel and activate all 6 plugins included. 4. Enable Ads Minded theme under Presentation. Any amount will do, I’ll take it as a bonus. Check out the widgetized version v2.0. Modified 2 lines of codes in style.css (change width of #topbar and #topbar .topbartext to 770px) for better cross browser display. Any feedback, please send me an email to or drop a comment here. This theme is in version 1 at the moment, I’m sure more will come. p/s : Those who are using this theme, please feel free to do a link exchange with this blog. As an appreciation, your website will be approved automatically. For everyone else, link exchange is still welcome, but the link exchange script will not approve your website if you do not have a link back. Just a kind reminder here. Don’t forget to replace all advertisement codes with your own. my firend when used this template he got a lot fo ctr. Hi SB –yeah, I know, but I don’t have this problem with any other theme so I was thinking you might know what the conflict would be. A really nice theme, thanks for sharing it :) I’ll report back when I find the problem in case anyone else finds this issue. I have a friend who have a blog which is really similar to this Adsense WordPress Theme and he really do a good approach on it. He implies also a technology type of blog for it. I will share if my friend founds some issues but as of now, the adsense wordpress theme taht he use is still on the testing mode. like ur theme.. i’d be using it…..
wordpress doing a great job. Great. I need to make a new site. Currently only tat2finder.net is up and running. I hope to have an ad-only site soon! 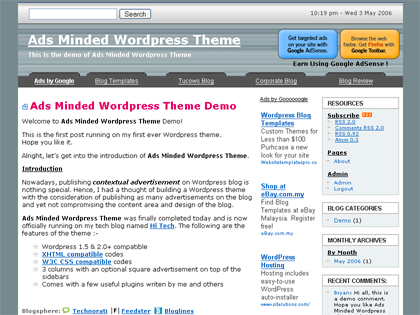 “first ever WordPress theme. Hope you like it.” I really like it. Nice theme I’m gonna use it on my next site http://shareitto.com . I loved the layout and design of the site. Share it to each other is my current website and I am constantly conscious of it’s design factor. Hello i will test your theme ! maybe i donate ;) Thx !